I can confirm the same inconsistent behaviour for Nautilus 2.24.0 (Intrepid). Thats' like 1000 days old. This is a very obvious bug and looks really bad. Ubuntu is known for it's user friendliness, and when it looks like something will be done and it isn't, it is _not_ user friendly. Therefore I believe it to be worthwhile for the ubuntu team to take a look at this bug. Search-folders in nautilus may be very useful and be a significant part of the users ubuntu-experience, but this bug must be fixed first. I agree with braweheart. The nautilus search tool is really bad at finding documents. 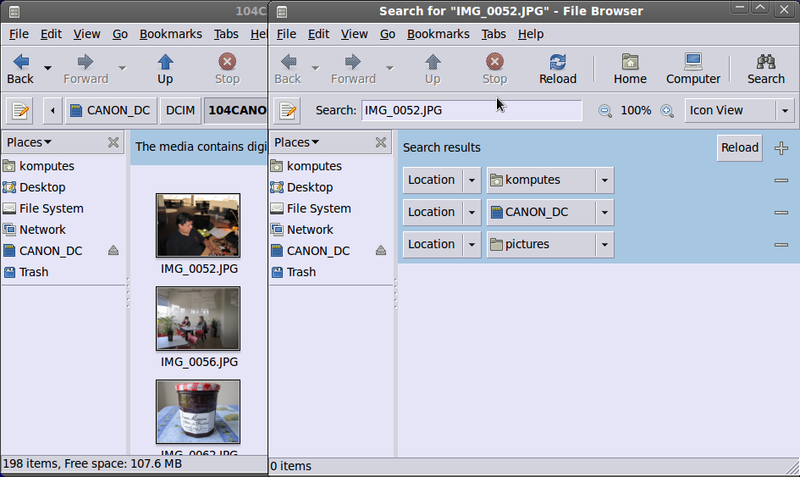 What ubuntu needs, for the sake of usability, is a comprehensive advanced search interface with full robustness to search different file attributes clearly. I will attach screenshots of how this looks in songbird when making an advanced playlist. This type of search is needed for the filesystem. Attached is proof that it will not find documents if it is not in the last "Location" field. Nautilus' current search is great for most of your searches. When you have a folder with many files, you press ctrl + F and you are presented with the cursor already in the search textbox and all you need to enter a portion of the name and press enter. Simple and quick. Unlike Windows XP where you have to answer so many questions before you are even allowed to enter your search text. @pt123 - I agree that it does not go along with the whole "limited GNOME simplicity" thing. It is not meant as a replacement but as an option for advanced searches. As it is today, you cannot make a search to find files over 1GB or files of a certain type (for example) without resorting to the command line. 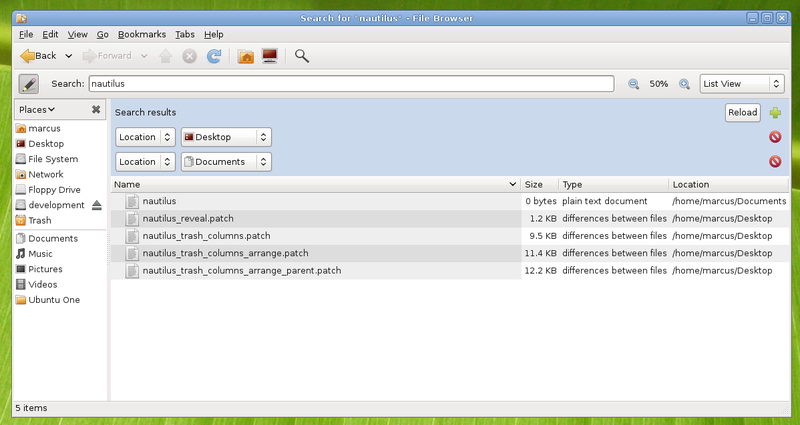 The fact is advanced search has been a user need in GNOME for a while. @braweheart @antistress - Please visit this brainstorm link to approve/vote/comment. OK, the problem is actually worse than I thought. Not in a single place (except for the gui) is the code enabled to handle more than one location, ranging from the NautilusQuery class, the engines to the XML file for saved queries. This is obviously not a papercut unless we disable the option to add multiple places in the gui (isn't super easy either). Adding a error dialog when searching multiple locations seems like the easiest (and ugliest) option. Upstream bugzilla seems to have problem attaching files atm  so I'm attaching it here first. This patch fixes the problem when you've selected multiple search locations and only the last one was search. It changes the NautilusQuery api, the savedSearch file format (compatible with previous format) and updates the simple search. As I'm not a tracker nor beagle expert I'd like them to update the other engines. To patch stuff is beyond me, but while you'r coding, may I be so bold and make a wish? I would really like to set "depth" for every folder, how many levels of subfolders that will be searched. I'm thinking of a numerical value that you could enter (perhaps a dropdown list) right next to where you choose the folder. This way it would be easy to merge some folders, and you'd get a really smart an easy to use search folder funtionality. Or should I just make an idea on ubuntu brainstorm instead? Anyway, many thanks for the bugfix, any chance it will get into Karmic? braweheart, of course you could make a wish ;-). But I do think you should create a separate bug for it (as this bug is for fixing what is broken). Fixing this for the "simple" search engine should be quite easy but I'm not sure how to do it for tracker and beagle (but still not trivial as you need to update the file format, the query api etc etc). Sebastien, yes I will, I have more patches that needs review so I'll contact them on IRC.